The recent sale of the “2,633 sq ft” Manhattan loft #7S at 90 Franklin Street (Franklin Tower) was a success in the sense that it sold quickly (21 days to contract) at a small discount (3%). After all, the point of marketing is to generate the highest bid from a qualified buyer in the shortest time preferred by the seller by exposing the loft to the broadest possible market. Add the fact that #7S moderately out-performed the June 2011 sale of #3S (which was in better condition than #7S), and the fact that #7S was sold by an estate, and the degree of success becomes more clear. Only a quibbler would worry about the fact that #7S at $3.3mm two months ago merely matched #3S in October 2007; only a quibbler would snark on manifestly successful broker babble. Somebody’s gotta quibble, it seems, but let’s wait on that and stay in success mode for a while. Sprawling, corner prime Tribeca loft-like classic style home boasts 9’6" ceilings and 13 oversized sun-filled windows facing South and West. 3 bedrooms, 3 full baths, library/den and a separate laundry room complete the home. The building has been geared for high-speed internet and cable access along with central air conditioning and custom climate control. … with recessed lighting, oversized banks of thermal pane windows…. Stainless steel kitchens are appointed with imported Boffi cabinetry and outfitted with center islands topped in polished stone. Bathrooms have Waterworks fixtures and have oversized glass steam showers and deep soaking tubs. Since that description is right out of the Building Notes from 2000 in our listings data-base, it appears that the #7S broker babble was more modest than the #7S condition. To me, however, one of the truly great features of this loft is encompassed in those first two babbled words, “sprawling” and “corner”. The footprint has the same shape of a classic Long-and-Narrow, but the corner gives it one narrow wall of windows and one long wall of windows; in other words, more of a Short-and-Wide footprint. The difference is, of course, more than semantic, with all rooms lined up along the long (errr, wide) wall, and public space at the corner. The result is a "2,633 sq ft" space that is far more flexible than if it had been a typical Long-and-Narrow with windows only front and back. Can we agree that no self-respecting loft would "boast" pf ceilings that are 9’6"? That means loft #7S has some self-image issues. See my post about the (dramatic) market impact of low loft ceilings, September 24, for 69 Murray Street loft, The Peak was then, and almost now. I might have resisted going further, but the opening provided by boasting of sub-ten ceilings is … an opening. Speaking of openings, the agent handbook should delete the modifier "over-sized" from the Window section. "Huge", or "floor-to-ceiling", or even "8 foot" are all perfectly descriptive. But "over-sized"? As in, too big for the room, or extending into the upstairs loft? Again, any self respecting loft should have windows bids enough to make mere "apartment" windows envious. You see it a lot, but we should just stop. Finally, you see that the babble excerpt above starts with the (somewhat remarkable) claim that the intersection of Franklin and Church is "prime" TriBeCa. Let’s put that quibble aside for today to snark on this bit of babble at the end of the extended babble: "… primely located …". That’s just wrong. No question that the last “S” line sale in the building, of #3S on June 15, 2011 at $3.1mm, is highly relevant to evaluating the market performance of #7S (a 6.4% premium to #3S) 14 months later. Some of that $200,000 spread is attributable to the difference between the 3rd and 7th floors, but not much of the spread. I wondered about the #3S sale in my July 3, 2011, dog bites man + 90 Franklin Street loft sells off only 6% since 2007, in which I noted that the condition of #3S had been upgraded since it last sold in 2007 by the addition of “newly installed wide plank Brazilian Cherrywood flooring ”. Otherwise, #3S seems to have been in 2011 in the same “[f]abulously chic” condition as when it sold in 2007. As that post’s headline has already told you, #3S sold in 2011 at a 6% discount to its prior sale (before the cherry floor). As it happens, that 2007 #3S sale was at $3.3mm, the 2021 clearing price for #7S. I can’t be certain, but my guess is that #3S is in slightly improved condition over #7S, and not just because of the cherry floor downstairs. So I can’t be sure if the gap in value between #3S in 2011 and #7S in 2012 should be even smaller, because the lower floor loft is in better shape. 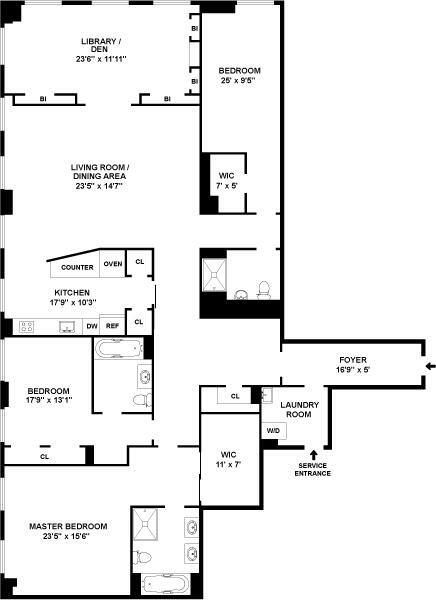 (It has the same footprint, obviously, but the #3S floor plan lacks the library at the corner of #7S, so #3S has a larger living room, fully open to the corner.) Assuming for purposes of simplicity that the two lofts are in ‘comparable’ condition, then we are left with the $200,000 gap between #3S in June 2011 and #7S in August 2012 that is too large to be accounted for by the different floor heights. Provisionally, I am going to look at these two sales a evidence that the 2012 market is improved over the 2011 market. Not by 6%, but improved. Let’s put the rest of the spread down to market noise and call it a week….